The Second World War has just finished, doggy food supplies are desperately short, and the Terriertorial Army has discovered that all its carefully-saved treats have been stolen in a daring raid by a marauding pack of bulldogs from across the Channel. Major Freddie, the Airedale commander, calls an emergency meeting of all the terriers. 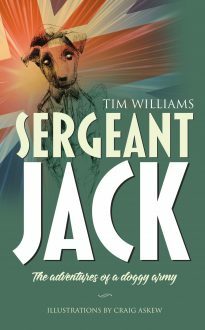 How will Sergeant Jack the Jack Russell, Melvyn, Lucky, Willy and the rest of the four-footed army get their treasured nibbles back – and stop the greedy Seedric and his companions from getting their paws on their food again? Described by the author as ‘a sort of doggy Dad’s Army’, this story will delight children aged seven to eleven.